The story of the fighter pilot the Red Baron himself sought to emulate . . .
German air ace Oswald Boelcke was a national hero during World War I, and was the youngest captain in the German air force, decorated with the Pour Ie Merite while still only a lieutenant and with 40 aerial victories at the time of his death. He became a pilot shortly before the outbreak of the war, and when he was tragically killed in a flying accident during combat less than two-and-a-half years later not only was his name known all over the world but the whole of Germany mourned his passing. He established his reputation on the Western front first in reconnaissance, then in scouts, and, with Max Immelmann, he became the best known of the early German aces. After Immelmann' s death, he was taken off flying and traveled to the Eastern front where he met a young pilot called Manfred von Richthofen. Transferred back to the Western Front in command of Jasta 2, when new small fighting units were formed he remembered von Richthofen and chose him as a pilot for his new Staffel. Boelcke was killed in October 1916, although not before the reputation of his unit, together with his own, had been firmly established forever. 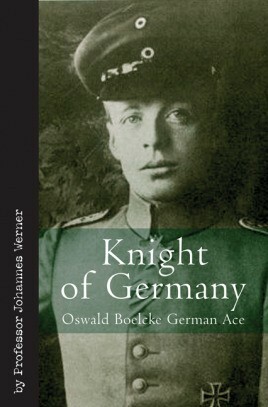 This absorbing biography was written with the blessing of Boelcke's family. Professor Werner was given access to his letters and other papers, and presents here a rounded and fascinating portrait of a great airman and a remarkable soldier, who became known as the father of the German Jagdflieger. This new edition has been completely reoriginated while remaining faithful to the language of the time of its original translation from German in the 1930s. Professor Werner was given access to his letters and other papers, and presents here a rounded and fascinating portrait of a great airman and a remarkable soldier, who became known as the father of the German Jagdflieger.